This was my first marathon and it was a great personal success. I put in nearly 1200 miles at an average pace of 7:47 MPM in training over the course of 19 weeks with the highest mileage week coming in at 80 miles. In the 19 weeks of training 6 days a week I missed only 2 runs. The first was a medium-long run at the end of a the first "step-back" week. I was absolutely exhausted. The other was a 4 mile recovery run on a day with 2 recovery runs scheduled, you know, a double and life just didn't cooperate. I had several goals for the race with my "In your wildest dreams" goal of 2:54:59, a stretch goal of 2:59:59, a "probably can do" goal of 3:04:59 and a "least acceptable" of 3:14:59. All but the "stretch" goal were based on Boston qualification standards. 2:54:59 would allow me to register on day 1 nearly guaranteeing a spot in the 2014 running of the Boston Marathon. 3:04:59 would allow me to register in the second phase and still nearly guaranteeing a spot. While 3:14:59 would still allow me to qualify though I would have to wait well into registration to see if there was a spot left for me. 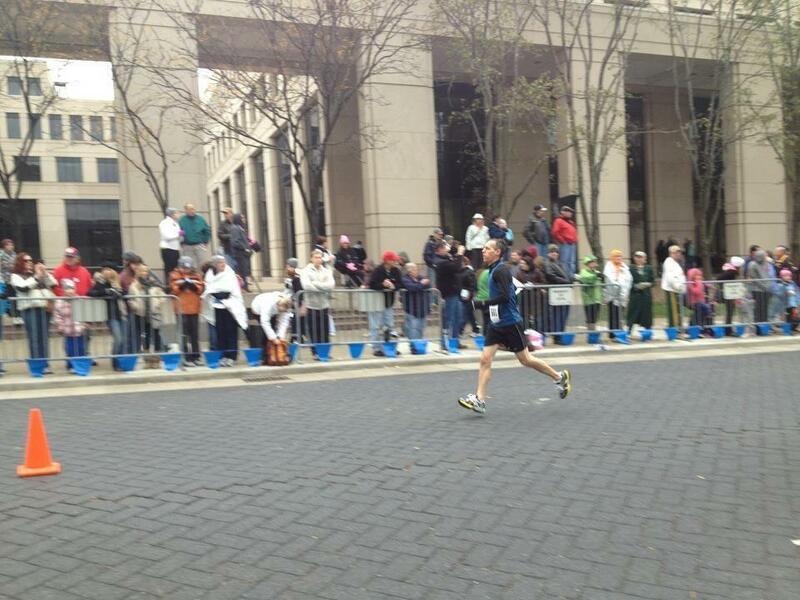 The 2:59:59 would have just allowed me to be considered a sub 3 hour marathoner. The race started in downtown Indianapolis and there was no race day packet pickup so we decided to stay in a hotel and skip the hassle of 2 trips. We checked into our hotel and headed to dinner at the Old Spaghetti Factory because there is no better place that I can think of to "carb load." After dinner we went over to the convention center for the the expo and packet pickup. I got a chance to say "hi and good luck" to Angie F who was making a return to the half-marathon distance after a year and a half absence. That was no surprise I knew she was going to be there handing out race packets but what was a surprise was that guy I raced at the BeeBumble back in September walked right past me. After a moments hesitation I went to catch him and say hi. We talked for a minute and I found that he enjoyed that race as much as I did and we planned to meet again next September. This was a surprising and exciting turn of events. We are both a couple of small town runners in the big city at a larger race and we run into each other none the less. The rest of the night was pretty uneventful, sleep was understandably a little restless but not to bad. I woke up around 5:30 AM, ate my traditional pre-race cliff bar and banana and headed out to the start area. I had a strategy for this race and it started with keeping it easy for the first couple of miles. So I lined up behind the 7:05 pace group figuring I would let someone else set the pace for the first 2 to 3 miles while I settled into a rhythm before striking out on my own at around 6:50 for the rest of the first half. As I stood there I would again meet up with my friend from the BeeBumble. We made small talk while we waited. The race began, we wished each other well and set off. The field was crowded and tight in the beginning to the point that I was shoulder to shoulder with another runner making the first couple of turns in the downtown area. As expected the crowd thined out pretty quickly. The pace group leader blew it on the first mile by going around 6:40 but I was amazed at how easy that pace felt. He made up for it over the next 2 miles by bringing it back to around 7:10 and I just followed. At mile 3 I made my move and picked up the pace to get to the 6:50 I was looking for in the first half. By this point some groups were forming and I would find myself becoming familiar with the runners around me each taking turns pulling ahead a little and falling back. Some of these runners would still be there at the end and some would fall off over the course of the race. One runner in particular stands out. He wore american flag printed shorts and I think 350 spectators and aid station volunteers must have commented on them. If you want people to notice you in a race wear some shorts that will stand out. Another part of my strategy involved making sure that I didn't dehydrate and didn't "hit the wall" because I ran out of glycogen. This marathon featured aid stations every 2.5 miles with Gatorade at every other station and Cliff gels at several of the stations. Fruit and chicken broth were supposed to be available at a few of the stations but I never saw either. My plan was to try to drink some at every aid station and take at least 3 gels through the race. By the 10 mile mark I felt that I had taken too much fluid and began to back off. I stuck with the plan for 3 gels taking 1 about 10 miles another at 15 and the last around the 20 mile mark. Overall, I was pleased with the execution of this part of the race and neither dehydration nor glycogen depletion was an issue at any point. I hit the half way mark and was really amazed at how good I felt. I started considering bumping the pace up a bit. Again, this was part of my strategy Hit the half way mark and if I still felt fresh try to negative split the race. Not much else to remark on between 13.1 and 20 or so. We hit mile 20 and I knew that this is where they say the marathon really is. I was a little nervous but at this point still feeling pretty good. A guy and a girl who were obviously running this race together but I hadn't noticed up to this point started to make a lot of noise. It seemed that she was starting to struggle and he was trying to talk her through it. It was a psychological challenge listening to him with his good intentions saying things like "I promise the pain will go away after we cross the finish line" and "only 6.2 miles to go...... 1 step at a time." I was getting deep into the race and had yet to see my family even though there were several places along the course that they had planned to get to and I had already passed. Little did I know that they spent over an hour in a traffic jam caused by the half-marathon runners. At mile 23 I finally saw my wife and I've said it before but that always really lifts my spirits. There she was cheering me on yelling "Go, go, you can do it!" While my wife was waiting for me at mile 23 my daughters, like super heroes, changed into their running clothes(yeah, they had their running clothes with them) and ran the last 5k of the marathon back to the finish to meet me there because with the traffic that was the only way to guarantee someone would be there. Some things just make you think "I have an awesome family!" and this is one of those things. Around mile 24 the pain of the marathon made itself known to me. My longest training run had been 22 miles and that was probably about 6 weeks ago. My hips, glutes, calves and feet just started to ache and burn. My back was becoming fatigued. Luckily, the route was coming back into the downtown area. The atmosphere was becoming festive, the crowd was growing and the landmarks becoming familiar. All of these things and the possibility of getting in under 3 hours really helped propel me over the next 2.2 miles. The only real scare during the entire marathon happened at about 25.5 miles. It had started to spit rain and my legs were coming undone in a hurry. I landed on a wet manhole cover and felt my leg buckle. I thought for sure I was going down. Some how, some way I remained upright. I knew in that instance that had I gone down it would have been very difficult to make my legs go again and finish the race. By the Grace of God, my foot slipped, my legs buckled a bit but my stride was not broken. We made 2 turns in a very short distance and the finish line came into view. I knew I wasn't coming in under 3 hours but I also knew that I had blown away my realistic goal of 3:04:59. 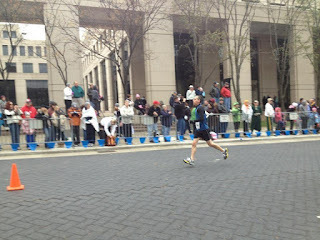 In the end I finished in 3:00:25 for 89th out of 2889 overall and 10th in my age division out of 333. 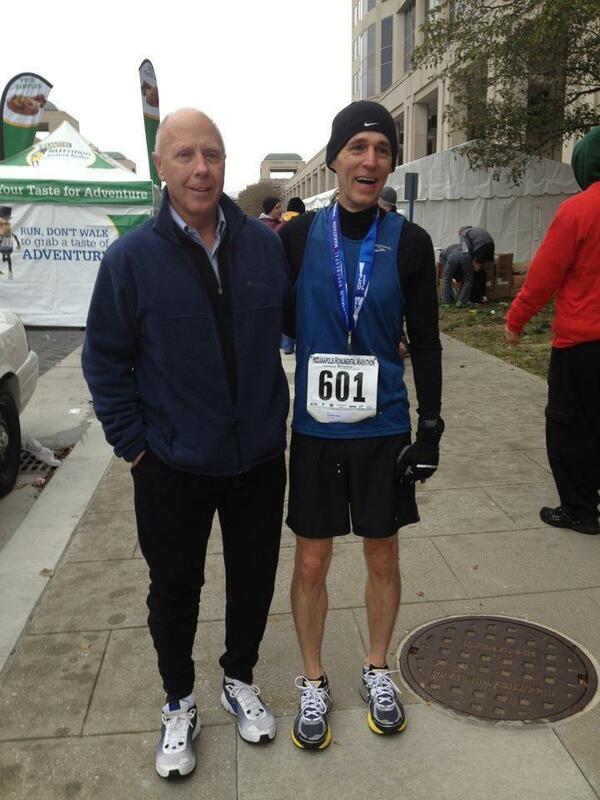 Tom, a great friend and fellow marathoner traveled a long way to be there at the finish. Thanks for all of the support Tom! There are so many positives to take away from this race. While I didn't negative split the race I did nearly even split it with the second half coming in just about 20 seconds slower and I am very pleased with that. Also, this is the first race that I have really planned a full strategy for and I feel like I executed it perfectly. Even my gear choice was dead on. I was comfortable the entire race. The only thing that I had to adjust during the race was my sock hat. If I got a little warm I pulled it off and carried until I got a little cool and put it back on. If you follow my training on daily mile you know that I battle being under/over dressed a lot. Most importantly, this definitely qualifies me for the 2014 Boston Marathon and gives me a very real chance of actually getting a spot and running in it. All of this in my first attempt at the marathon. I couldn't be happier with the result. As for the sub 3 hour goal, I guess that gives me a reason to train through the winter for an April Marathon.